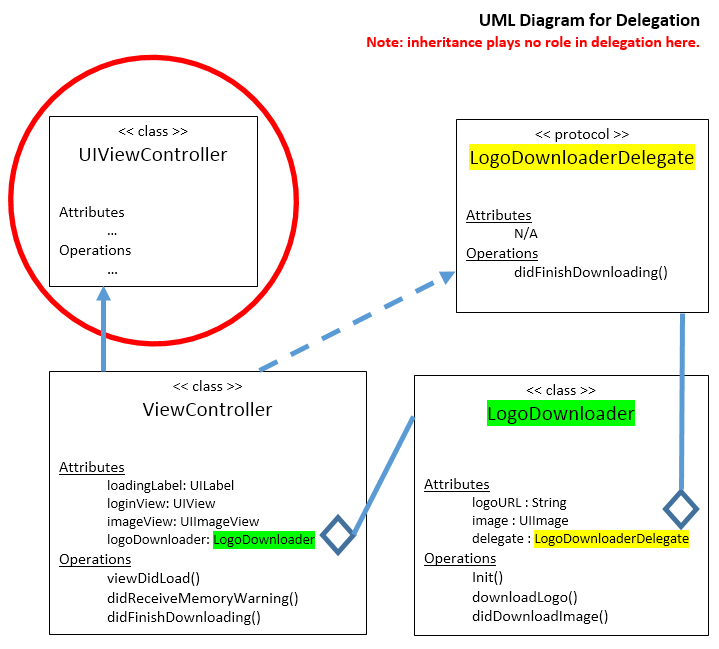 Delegation is a design pattern that enables a class or structure to hand off (or delegate) some of its responsibilities to an instance of another type. This design pattern is implemented by defining a protocol that encapsulates the delegated responsibilities, such that a conforming type (known as a delegate) is guaranteed to provide the functionality that has been delegated. Delegation can be used to respond to a particular action, or to retrieve data from an external source without needing to know the underlying type of that source. // class is a DELEGATING OBJECT. // and DispatchQueue.global returns immediately. // (NSData), but I'm doing so in the BACKGROUND. // THREAD TO UPDATE THE UI. // "at the appropriate time [it] sends a message to" the delegate. // for "View as: iPhone SE." @IBOutlet weak var loadingLabel: UILabel! @IBOutlet weak var loginView: UIView! // Initially, the image view is hidden so we can fade it in with animation. // until the logo image downloads, and then we fade it in. let imageURL: String = "https://cdn.spacetelescope.org/archives/images/publicationjpg/heic1509a.jpg"
// Construct a LogoDownloader to download the NASA file. // this class, ViewController. ViewController is the delegate. // finished downloading when didFinishDownloading(_) is called. // can run with or without the delegating object. // when the logo image finished downloading.